This is my interpretation of the Sefer Yetzirah. It does not reflect very closely the orthodox spirit of the original. Readers should bare this in mind and not be misled into thinking that this is an authentic translation of the original. This is a work in progress that contains some original ideas. All creation is formed from three sacred principles: Yin, Yang and Balance. These three mothers are Aleph= Balance, Mem=Yin and Shin=Yang. These three and their transcendental combinations equal 22 Sacred letters: The three mother letters: Aleph, Mem and Shin; the seven double letters and the 12 simple letters. The three mother letters and the seven double letters form the Tree of Life. The point is the simplest shape, the line is the simplest shape in 1 dimension., the triangle is the simplest shape in 2 dimensions. The tetrahedron is the simplest shape in 3 dimensions. Aleph corresponds with the simple point. The mother letters Mem and Shin correspond with the 2 points of the line. Bet, Gimel and Dalet are each composed of 2 simple letters in combination and they correspond with the simplest 2 dimensional shape: each one a point of the triangle. Koph, Peh, Resh and Tau are composed of in effect all 3 mother letters in combination and they correspond with the simplest 3 dimensional shape: each one a point of the tetrahedron. Dalet which is composed of Shin and Mem and is thus balanced. Koph which is composed of Beth and Gemel. 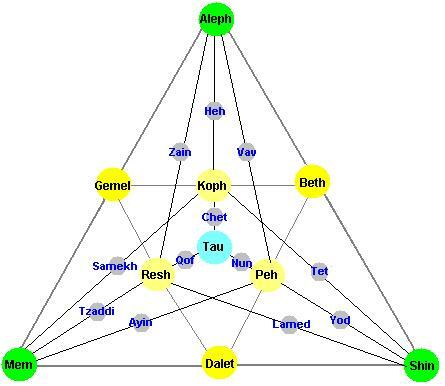 Tau which equals Aleph + Shin + Mem, Bet + Gimel + Dalet and Koph + Peh + Resh and thus is balanced. Mem the mother of water, the mother of yin. Gemel which is composed of Mem and Aleph and is thus overall yin. Resh which is composed of Gemel and Dalet and is thus overall yin. Shin the mother of fire, the mother of yang. With it engrave and carve the Throne of Glory, Seraphim, Ophanim, holy Chayot, and Ministering Angels. From the three establish His dwelling, as it is written, "He makes His angels of breaths, His ministers from flaming fire" (Psalms 104:4). Five: With three of the simple letters seal "above". Choose three and place them in His great Name: YHV. With them seal the six extremities. Face upward and seal it with YHV. Six: Seal "below". Face downward and seal it with YHV. Seven: Seal "east. Face straight ahead and seal it with HYV. These are the Ten Sefirot of Nothingness. One is the Breath of the Living God. Breath [from Breath], Fire [from water, and the extremities], up, down, east, west, north and south. The seven doubles correspond with life, peace, wisdom, wealth, grace, fertility, dominnance. Each has two sounds: B-Bh, G-Gh, D-Dh, K-Kh, P-Ph, R-Rh, T-Th. A structure of soft and hard, a structure of strong and weak, double because they are transposes. The transpose of life is death, the transpose of peace is evil, the transpose of wisdom is folly, the transpose of wealth is poverty, the transpose of grace is is ugliness, the transpose of fertility is desolation, the transpose of dominance is subjugation. There are Seven Doubles: Seven and not six, seven and not eight. contemplate them deeply, make each pure one stand on its own essence, and return the mind to its source. The seven doubles correspond with the seven directions. These are the up, down, east, west, north, south and the center which upholds them all. 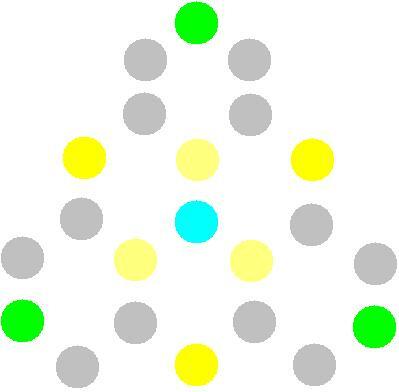 Twenty-two foundation letters: They are set in a circle as 231 Gates. And this is the sign: There is no good higher than delight (ONG), and there is no evil lower than plague (NGO). How? Weigh them and transpose them, Aleph with each one, and each one with Aleph; Bet with each one, and each one with Bet. They repeat in a cycle. Therefore, everything formed and everything spoken emanates in one name. The twenty-two letters through permutations and transformations depict the nature of all that was, all that is and all that will be in the future. how does one permute them? Two stones build two houses, three build six houses, four build 24 houses, five build 120 houses, six build 720 houses, and seven build 5040 houses. From there on go out and calculate that which the mouth cannot speak and the ear cannot hear. "Also every desire, one opposite the other was made by God" (ecclesiastes 7:14). Good opposite evil, good from good, evil from evil. Good makes evil recognizable, and evil makes good recognizable. Good is kept for the good, and evil is kept for the wicked. Three: Each one stands alone. Seven are divided, three opposite three, with a decree deciding between them. Twelve stand in seeming conflict: three who love, three who hate, three who give life, and three who kill. The three that love are the heart, the ears and the mouth; the three that hate are the liver. the gall bladder, and the tongue. And God, the fathful King dominates them all. One over three, three over seven, and seven over twelve, and all of them support and are supported by each another.